Source: U.S. basins from U.S. Energy Information Administration and United States Geological Survey; other basins from Advanced Resources International (ARI) based on data from various published studies. For the next two weeks (Dec. 23 - Jan. 3), Today in Energy will feature a selection of our favorite articles from 2013. Today's article was originally published on June 10. Estimated shale oil and shale gas resources in the United States and in 137 shale formations in 41 other countries represent 10% of the world's crude oil and 32% of the world's natural gas technically recoverable resources, or those that can be produced using current technology without reference to economic profitability, according to a new EIA-sponsored study (see Table 1) released today (June 10, 2013). More than half of the identified shale oil resources outside the United States are concentrated in four countries—Russia, China, Argentina, and Libya—while more than half of the non-U.S. shale gas resources are concentrated in five countries—China, Argentina, Algeria, Canada, and Mexico. 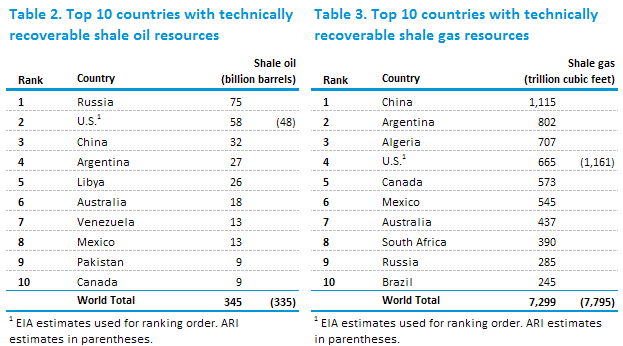 The United States is ranked second after Russia for shale oil resources and fourth after Algeria for shale gas resources when compared with the 41 countries assessed (see Tables 2 & 3). 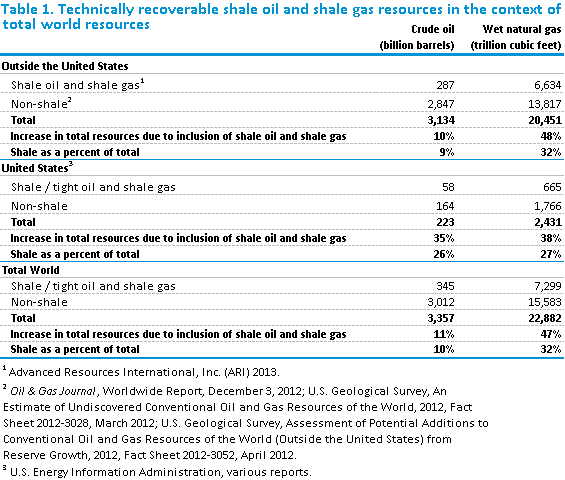 Technically Recoverable Shale Oil and Shale Gas Resources estimates that shale resources considered in conjunction with EIA's own assessment of resources within the United States indicate technically recoverable resources of 345 billion barrels of world shale oil resources and 7,299 trillion cubic feet of world shale gas resources (see Table 1). While the current report considers more shale formations than were assessed in the prior version of this assessment, it still does not assess many prospective shale formations, such as those underlying the large oil fields located in the Middle East and the Caspian region. Currently, only the United States and Canada are producing shale oil and shale gas in commercial quantities. Unlike an earlier EIA-sponsored study that focused exclusively on natural gas, the new world shale assessment includes shale oil, which has recently been produced in significant volumes in the United States. In addition, more and better geologic information has become available for shale formations located outside the United States, in part because the earlier report stimulated new work on shale resources in many countries (e.g., Algeria, Argentina, and Mexico). These shale oil and shale gas resource estimates are highly uncertain and will remain so until they are extensively tested with production wells. This report's methodology for estimating the shale resources outside the United States is based on the geology and resource recovery rates of similar shale formations in the United States (referred to as analogs) that have produced shale oil and shale gas from thousands of producing wells. Because they have proven to be quickly producible in large volumes at a relatively low cost, shale / tight oil and shale gas resources have revolutionized U.S. oil and natural gas production, providing 29 percent of total U.S. crude oil production and 40 percent of total U.S. natural gas production in 2012. 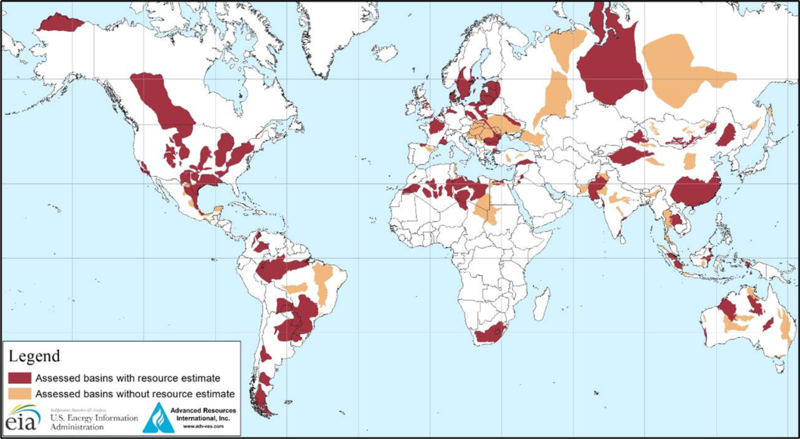 However, given the variation across the world's shale formations in both geology and above-the-ground conditions, the extent to which global technically recoverable shale resources will prove to be economically recoverable is not yet clear. The market impact of shale resources outside the United States will depend on their own production costs and volumes. For example, a potential shale well that costs twice as much and produces half the output of a typical U.S. well would be unlikely to back out current supply sources of oil or natural gas. In many cases, even significantly smaller differences in costs, well productivity, or both can make the difference between a resource that is a market game changer and one that is economically irrelevant at current market prices. 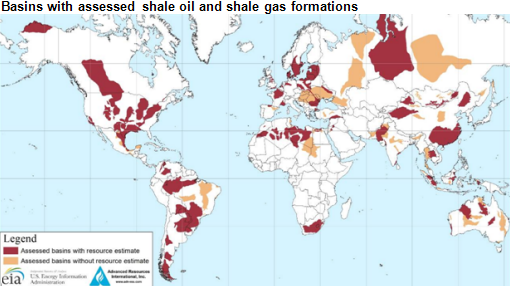 Several nations have begun to evaluate and test the production potential of shale formations located in their countries. Poland, for example, has leased prospective shale acreage and drilled 43 test wells as of April 2013. Argentina, Australia, China, England, Mexico, Russia, Saudi Arabia, and Turkey have begun exploration or expressed interest in their shale formations.